When I was kid I was the only child in the family who had roamed beyond the two-block radius around our home before reaching the age of six. In fourth grade, while everyone was using saw dust to show creativity in our map project, I used crushed egg shells for my map of Leyte. I have always had this thirst for uniqueness and discovery; to do what others do differently. And I’ve taken this principle even in my treks. 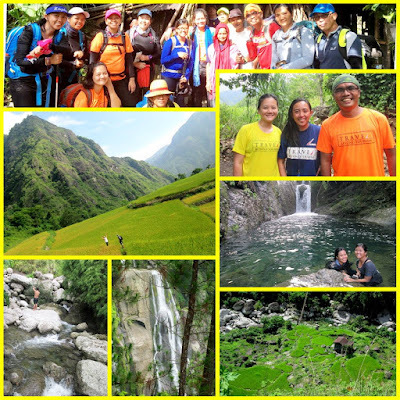 Here are some of the things that make Lagataw treks different. Everyone knows how easy a climb Mt Timbak is. But they have not tried starting from Lake Ambuklao. In Lagataw treks we choose routes that are not frequented by mainstream hikers. These local trails meander through scenic landscapes as opposed to conventional hiking routes where the views are often only found at the summit. The views in our routes are all so scenic that you'll sometimes hear 'Hwag na kayo mag-picture dyan. buburahin nyo rin yan pag nakita nyo ang mga susunod na spots.' And because we want to keep these routes unspoilt, we observe the ‘don’t ask don’t tell’ principle. The idea of conveying 12 participants down this slippery boulder always gives me nightmares before the trek. The trails we take are immaculate. They are used only by locals, so you won't see a lot of unpleasant debris from mountain tourists. And because they are used by locals every day, they are conveniently passable; no bushwhacking needed. The trails, however, are oblivious of the ineptitude of many mountain tourists. The trails only care about conveying locals from one sitio to another in the shortest possible distance. As a result, they would often involve steep ascents and descents. They also don't take into consideration the limitations of your Vibram outsole. 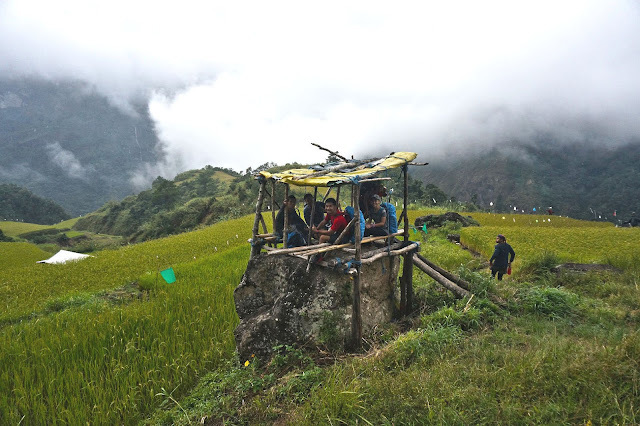 You'll be treading on virtually all kinds of terrain: rolling pebbles, mossy boulders, mossy steps, mossy hard clay, narrow fringes of rice paddies, dilapidated suspension bridges, etc. Experience in the outdoors is necessary in Lagataw treks. The whole course is dotted with picturesque views and we've chosen the best spots to relieve your tired muscles. These spots, if they were near Manila, would be independent destinations in themselves. They make it very difficult to draft the itinerary because everyone would wish to camp at each of these spots but we've got limited time so we only spend a few minutes there. That’s how our take-fives are. 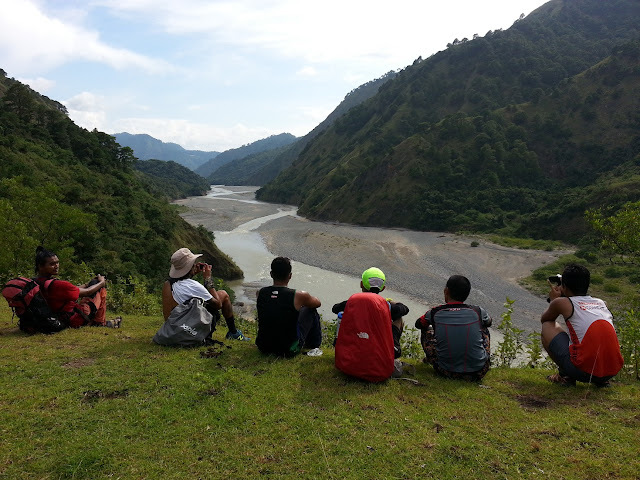 One of the most successful and memorable treks we had was participated in by this small but homogeneous team. We make sure that the team is as homogeneous as possible in terms of pacing and attitude. We profile aspirants according to their ‘trekking resume’ including recommendations from mutual friends. Strength and endurance are integral criteria in the screening. But many forget that dexterity and the ability to negotiate technical terrain are equally important. But most importantly, we look for attitude. We respect and encourage diversity in personality, gender, creed, and body size. But we are very particular about good attitude towards travelling with strangers. Are you a good team player or you expect to just lull yourself on a hammock and just wait for the ‘Kainan na!’ call? Can you acknowledge that sometimes you could be wrong or you’re the know-it-all who would join a climb and dictate where and when the whole party should camp and take rests, or how the socials should go? We don’t need someone who wants to modify the itinerary and the guiding principles of Lagataw treks to cater to his/her own idea of a good trek? The homogeneity and the small size of the team as well as the length of the journey make it possible for each participant to interact with other members of the climbing party. This is very difficult to achieve in a day hike at Mt Ulap where you have more than twenty guests. In hikes like that, the sole objective is usually to be able to say 'been there, done that, got the shirt'. But we want to go beyond traveling as strangers in one group. We want the team to be a community of like-minded individuals interacting with each other and learning together the teachings of the terrain and the small community they immerse themselves into. 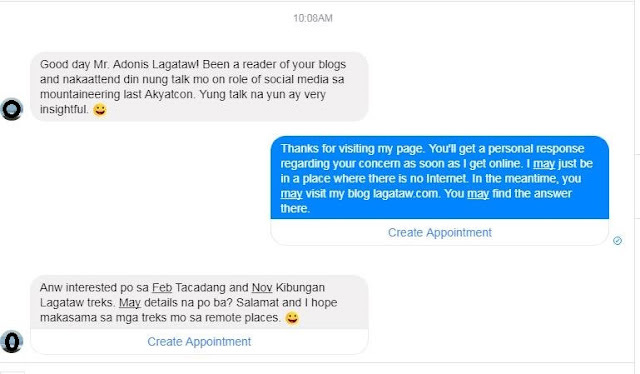 As a result, some participants of previous Lagataw treks become really close friends that they even form their own mini teams and trek by themselves sometime after the event. This makes us feel proud that something good has come out of the trek. This one's a good introduction. Perhaps the most novel feature of Lagataw treks is the screening process. One easy criterion to qualify you or not is your first question. Most who immediately ask 'Magkano po event fee?' or 'Patingin po ng itinerary' are immediately seen zoned. We prefer to hear 'Kaya ko po ba to?' or 'Gusto ko sana i-try kaya lang qualified po ba ako?' We could get really prejudicial during this first inquiry phase. If you ask ‘How much?’ and that information is included in the very short event description, you would be regarded as ‘the typical entitled millennial guest who has no time to read’. 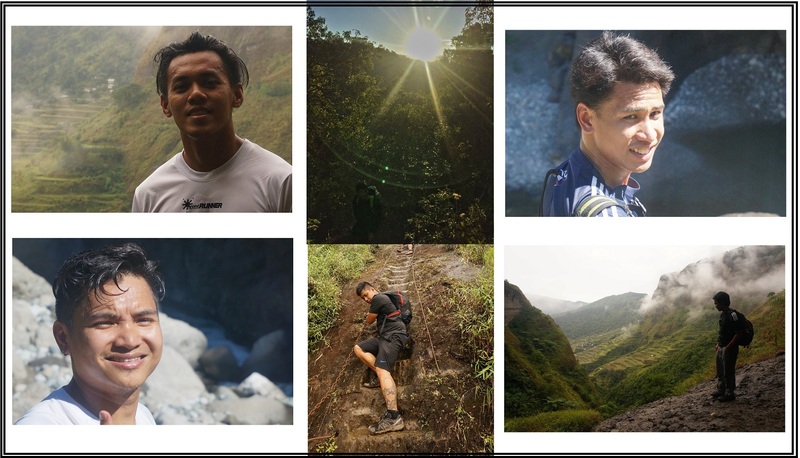 There was also one time we had to ignore someone because his profile picture seemed to shout ‘I’m a mountaineer!’ because of his proud Taong Bundok statement shirt. Your profile picture says a lot about your character. After all, you’ve carefully selected that among a gazillion of your photos to best represent who you are. Sadly, we have a bias against someone whose profile picture features Mt Batulao. We don’t aim to be loved by a million. We prefer quality over quantity. 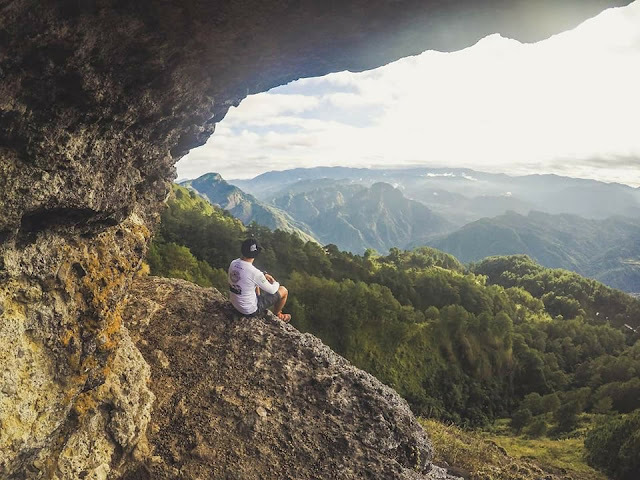 We believe the outdoor adventure community in the Philippines has gotten too big. Many hikers follow one pervasive protocol: I’ll make the reservation deposit and someone will find a way to get me to that selfie spot. We want to empower our participants. We hope that when the trek is over they will have learned how to distinguish water that is safe to drink or to somehow determine the right way even without the directions of a guide. We sometimes select some participants to lead the team and others to handle radio communication so that they can have a taste of responsibility and power. We want them to know that each of them can be leaders. And in order to further spread this culture and knowledge we teach and encourage them to organize their own events. Many think that the ‘don’t ask don’t tell’ principle revolves around the concept of greed. But in fact, we’re actually just choosing who to tell. Jane admits that cooking rice is the only thing she knows in the kitchen. But she gladly (and nervously) accepted the challenge given to her by the breakfast team leader to prepare some soup at 4 in the morning. 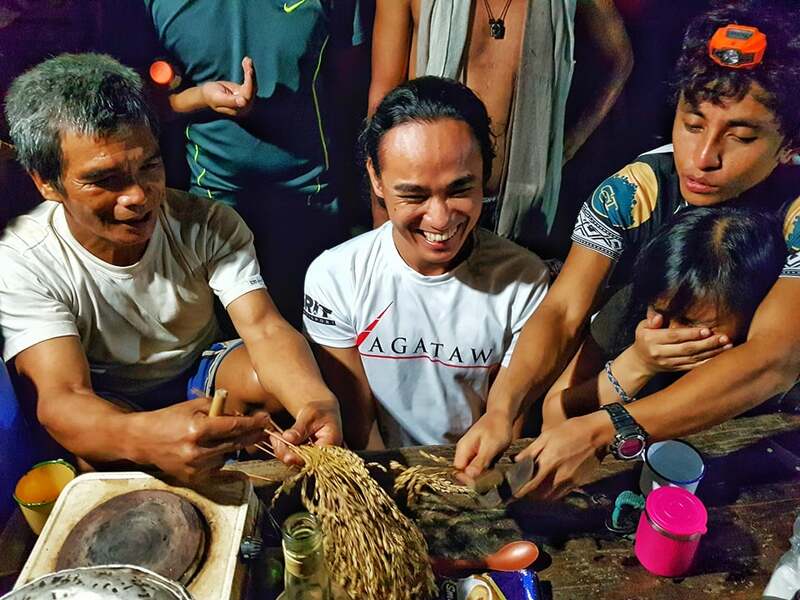 Another unique feature of Lagataw treks is the Meal Teams. We can’t present to you a gourmet chef in the house. That’s because we believe that with teamwork you are all capable of serving the most sumptuous meal outdoors. We divide the whole climbing party into three teams—Breakfast, Lunch and Dinner teams. Usually the stronger ones belong to the dinner team so that the tail pack will have some hot soup to sip by the time they get to the camp site all tired and testy. The tail usually belongs to the breakfast team. They often have to wake up very early to prepare our breakfast. Some see this as some sort of consequence for being slow and weak. 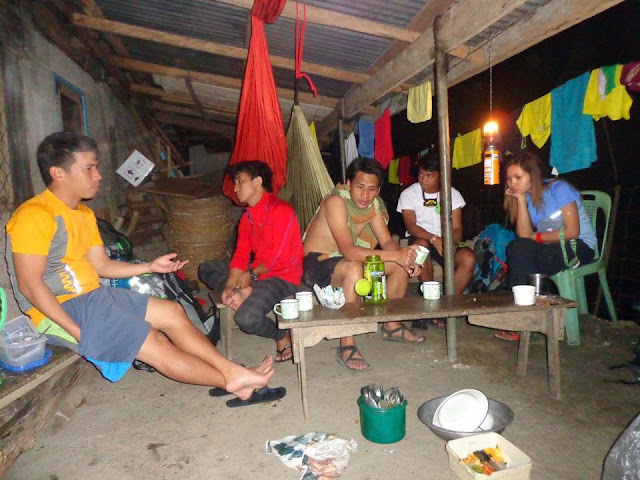 But we’d like to see it as a reward for the faster and stronger ones who prepared dinner the previous night that gave the other teams the perk to not do any task after the day’s tiring trek. Those who are organized and systematic when working usually belong to the lunch team. They make sure that no time is wasted while preparing lunch en route to the destination for the day. Each team is responsible for the procurement, conveyance, preparation and after-care of the meal assigned to them. This system not only promotes camaraderie, teamwork and sense of responsibility among team members but it also ensures the proper distribution of load and work among each of the participants. As learning is an important tenet in Lagataw treks, we want the participants to learn about the life in the remote areas we visit. What better place to learn these things than a local house? One of the things you’ll learn when you spend the night at a local house is how much they value rice in the Cordilleras. You may also learn an interesting way to start fire. We also discourage participants from bringing alcoholic beverages and encourage them, instead, to try local wine like tapey and basi. We also buy some of our ingredients in the small village stores. 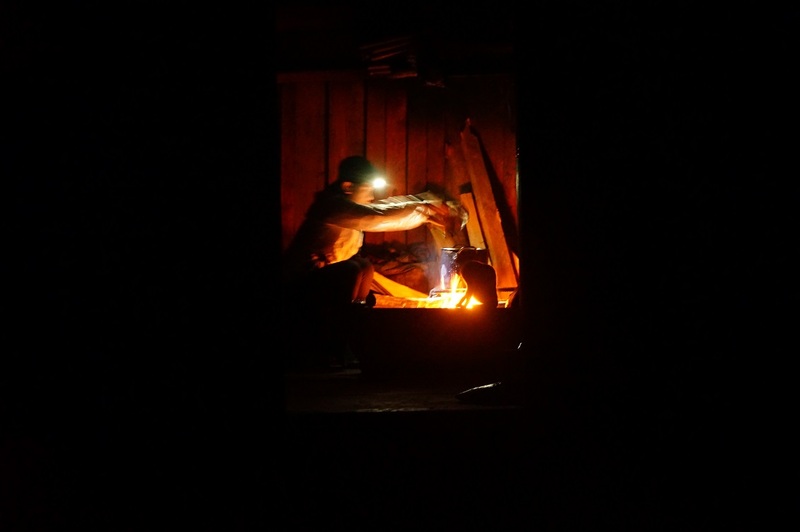 Through these practices, we are able to minimize our impact; build environmental and cultural awareness and respect; provide positive experiences for both visitors and hosts; provide direct financial benefits for conservation; generate financial benefits for local people; and deliver memorable interpretative experiences to visitors that help raise sensitivity to host community’s political, environmental, and social climates. But aside from giving way to the principles of ecotourism, homestays and local stores also free us from the unnecessary burden of our tents and some goods. As we have previously traced our routes without the aid of local guides, there could be segments where we’ll be trekking by ourselves. In these segments we give you the opportunity to learn one very useful outdoors skill—to ‘smell’ the trail. We let you lead the way and decide which way to take at forks. It’s fun to learn how to read maps but isn’t it more exciting to learn how to read the actual terrain—what the contours of your topographic map represent? There doesn't have to be any liquor. Sometimes brewed native coffee is enough to provide a stimulating discussion. And because we want to minimize our physical and behavioral impacts in the locality, we avoid the traditional raucous kind of socials. We drink, if at all, in moderation and we make sure that we don’t disturb the peaceful night of the villagers. During the socials, we try to get to know each other better. We sometimes put the spotlight on each of us one by one. We encourage you to speak about either your field of expertise, your hometown, your hobby, basically just about anything that points to you. When we’re too tired, we just hit the hay right after dinner. 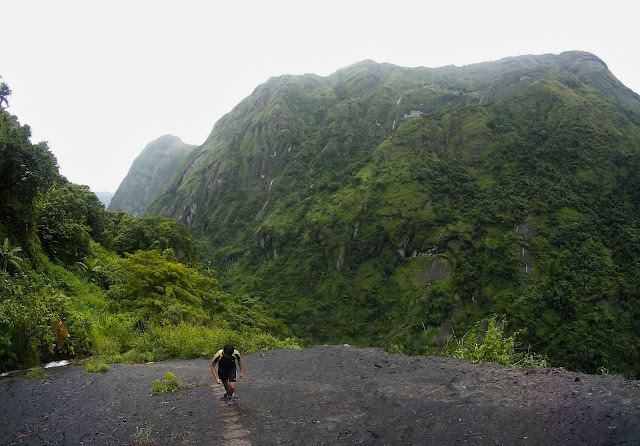 It is the mission of Lagataw treks to revolutionize trekking in the Philippines. We want you to learn about adventure hand in hand with responsibility. So if you’re the one who wants to get off that ‘Here’s my event fee get me to that selfie spot’ bandwagon, we’re waiting for you! If you think others need to read this, don't forget to share it. More Power to the group and God bless your endeavors.